Welcome to the PTTK Wyspianski Hotel in Krakow, a convenient hotel well adapted to the needs of both business and leisure travelers, and with an excellent location only a five-minute walk away from the Old Town's centre. 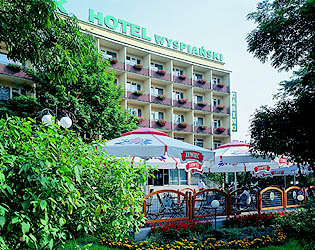 After a complete renovation, the Wyspianski welcomes its guests with a cordial atmosphere and convenient facilities. Its 158 single and double rooms are comfortable, modernly furnished, and all of them feature a bathroom with a shower, satellite TV, radio, and telephone. The restaurant serves a varied menu of Mediterranean and regional specialties, and the bar has an inviting atmosphere along with a wide selection of drinks and cocktails. The hotel features 3 fully equipped conference rooms (for up to 160 people) and a business room. In the hotel you'll also find a Casino, souvenir shop, bank agency, left-luggage room, and currency exchange service. Parking is available for coaches and private cars next to the hotel. The JAN-POL Incoming Department organizes specialized tours for groups and individuals in Cracow and the rest of the country. 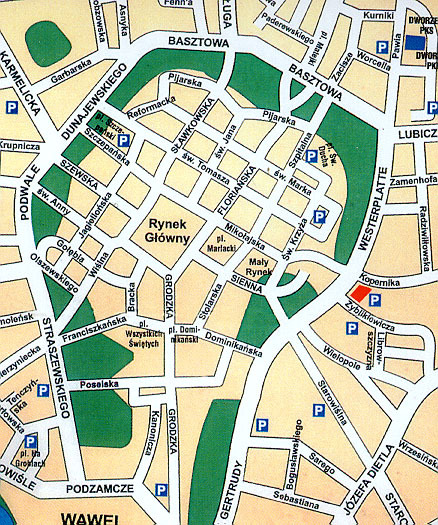 The Wyspianski hotel Krakow accepts the following credit cards: Visa, MasterCard, EuroCard, Dinners Club, JCB, PBK Styl, and Polcard. The hotel enjoys a central location just a 5-minute walk away from the Old Town's centre. All major tourist attractions, restaurants and shops are easily reached from the hotel.